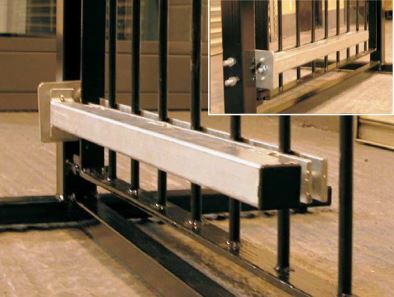 The Adapt-A-Gate provides a robust closing system for most types of gates. Designed to fit a wide variety of gate and post configurations, the included mounting kit enables the unit to be bolted, clamped or welded to the gate. Depending on hinge configuration the Adapt-A-Gate will allow the gate to open up to 180 degrees. The heavy-duty design provides maximum protection to the gate closer mechanism which is concealed within a strong, box section chassis. The gate closer chassis and post brackets are supplied galvanised for long-term corrosion protection.